REDUCED 10K! WOW! What an amazing waterfront home being completely remodeled and ready for a new owner. Within the past six years this 2 bedroom, 2 bath split plan home has been totally transformed. On top of the breathtaking views the exterior has also had a facelift. 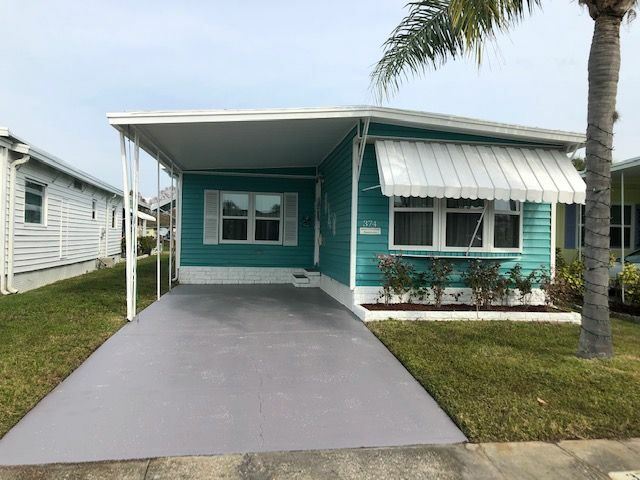 The vinyl siding has been painted with an appealing coastal color, roof over, the entrance doors have been updated, all new windows can be found throughout, an extra large shed with washer and dryer, private dock and a fabulous patio with aluminum covering. All before entering the home which is drywalled and painted with pleasing neutral colors, open concept plan in the living/kitchen and dining areas. The all new island kitchen has an abundance of cabinets, new countertops and appliances. The sought after split plan gives you a sizable bedroom in the front of the home with a delightful picture window. A newly remodeled guest bath is just off of that room with a walk-in shower and stunning vanity. In the back of the home is a Florida room with beadboard walls and again those captivating views. French doors takes you to the master suite with plenty of closet space and an en suite bath. This bath has been extended to allow for a generous sized walk-in shower and elegant vanity. All of the subfloors are plywood and the the flooring is allure and laminate. Faux wood blinds and sheers embellish the windows. The ceiling fans, updated water heater and central heat and air are a few added features. The home will be sold beautifully furnished and decorated for your convenience. Nothing to bring but yourself and your personal items and begin your fun-filled Florida vacation. To top it all off the ten foot boat will be included in the sale! This impressive home is priced at $109,900 which also includes the share of $55,000. Call today for a showing as these waterfront properties do not last!